Over the past 6 months I've peppered posts featuring renovation updates. And now I bring you my kitchen! I know, I've never really seen the appeal of kitchen decor. It has only ever been a room for convenience for me. 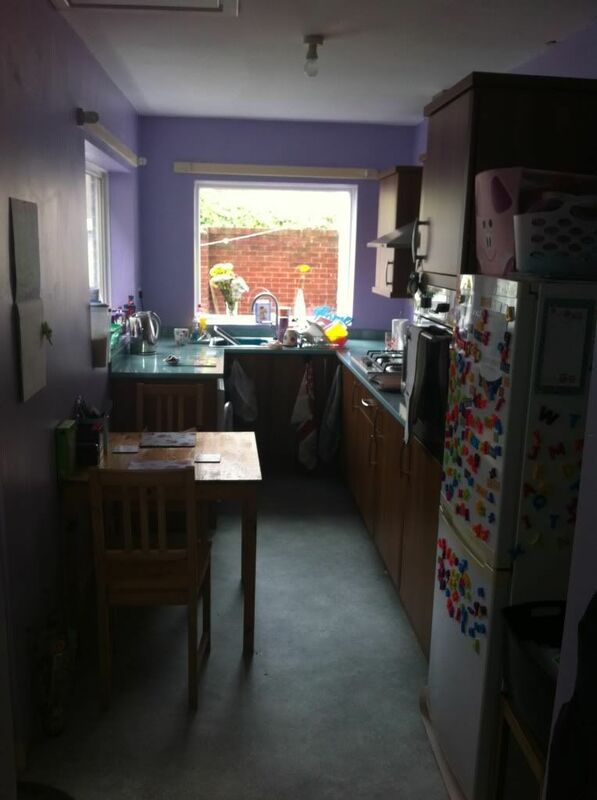 My parents kitchen was part of an open plan kitchen / diner / living room, so it didn't really need much 'styling'. But when the kitchen was my own kitchen, and started taking shape, my sense of style started 'leaking' into my kitchen. Don't worry, I cleaned it up!! It is a long galley kitchen - with dual aspect windows and a back door leading out into my yard. 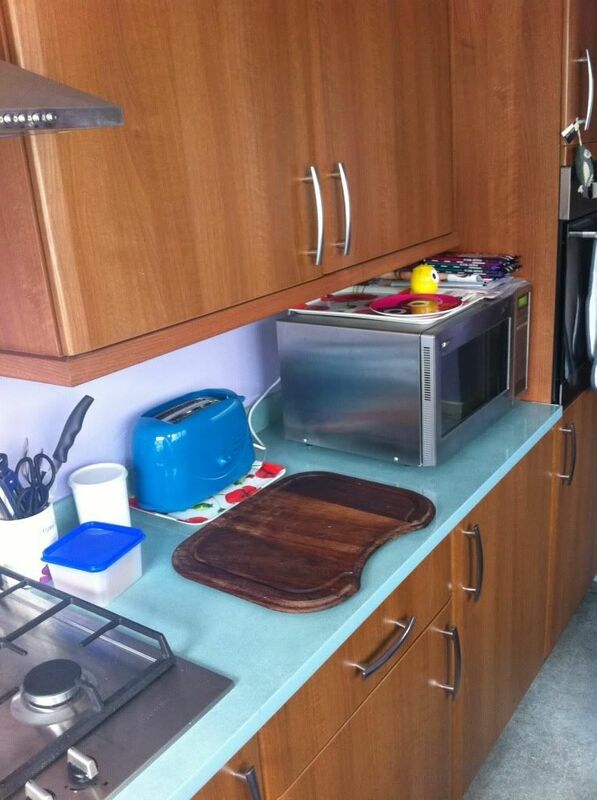 My colour scheme for my whole house is teal and lilac, and in my kitchen, the two colours meet. My work tops are a lovely cracked glass laminate, from B&Q, which is a pale teal. My units are a warm walnut, which works due to the amount of natural light I get in my kitchen. I knew as soon as I paired the cracked glass with lilac that this was the colour scheme for me. I love contrasting colours, and vibrant prints, so it wasn't too big a leap to expect something similar in my first home. 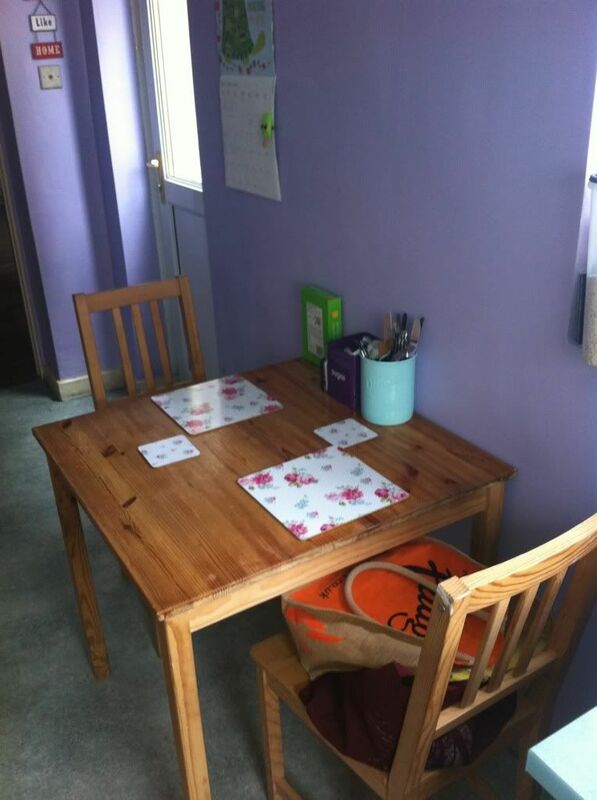 And here we have a square table bought from eBay (it came with another 2 chairs, but they are used at my dressing table, and at my computer). It is simple but just what I need. My love for vintage and vintage floral prints is again clear here, with the placemats and coasters, with some contrasting storage pots for my cutlery and bits and bobs. My kitchen, my rules, so there are some things that could be put away, but I like to keep them out and within reach. I am a fan of clutter and making the kitchen feel like it is used, and not just a show kitchen. There we have it - once my kitchen was finished, I knew that it was my kitchen. I had put my style, my sweat and my soul into designing it, building it, and painting it. Every time I walk into it, either for a cup of tea, or a load of washing, or even to clean it, I know it is a perfect fit for me. 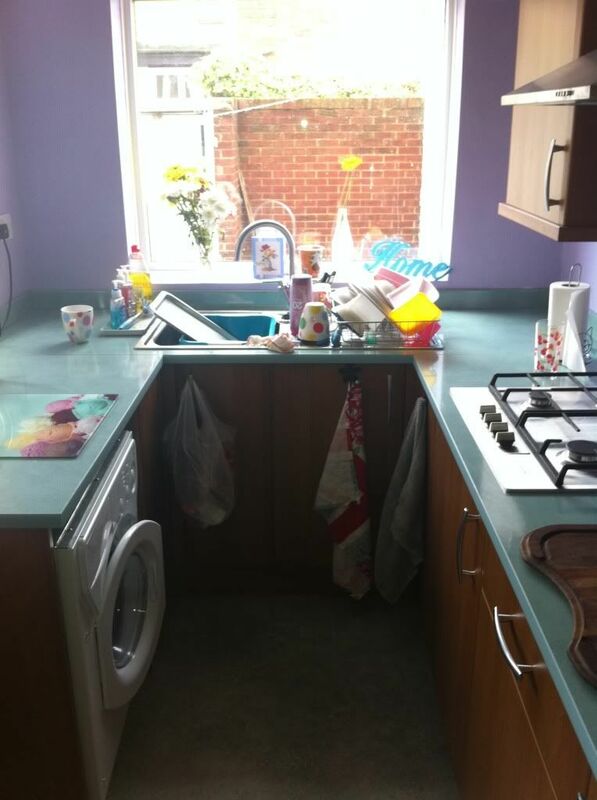 That is a lovely kitchen we have been in our house 7 years now and the kitchen still hasn't been done! I love the worktops. I'm coming over for a cuppa one day! I'm inviting myself.